Been playing F1 2011 for a while now and am yearning for a management game, online or offline is good. Suggestions? It will launch within few months, but it looks really interesting. Thanks! Looks interesting! Any clues about to its features? 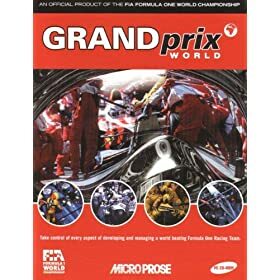 If you are looking for offline then I suggest Grand Prix Manager World 2 which is an old game (1997) but has mods for it up to last years season (2011): http://www.gpm2world.com/ If you look in the downloads section under the 'Games' tab it has the game up for download and under 'Patches' to run it without the cd. Then if you look under 'Mods' they seem to have every season from 89 to 11. Edit: Another game is Ea Sports F1 Manager. Could probably pick it up on ebay or something as it came out around 2000 I think. Last edited by RocketSkates on Tue Apr 17, 2012 1:23 pm, edited 1 time in total. Www.F1-Tm.com start your own team hire your staff develop your facilities and manage 2 drivers and their race strategies all weekend. Option to manage 1 race a day or every other day. http://Www.F1-Tm.com start your own team hire your staff develop your facilities and manage 2 drivers and their race strategies all weekend. Option to manage 1 race a day or every other day. I also put a vote in to F1TM. Good game, great community. I'm playing http://igpmanager.com and enjoying it. Grand Prix Manager 2 is still the best proper F1 management game but it's very old now. I remember playing an EA management game in the early 2000s which seemed okay at the time but I barely remember it. I find the online ones far too slow. GPM2 was amazing, back in the day I'd lose days playing it. Old game but has alot of good mods for example season 2001, 2007, 2008, 2009, 2010, 2011 etc. all mods are downloadable on the site. As for online game BATRACER seems quite good. Last edited by Tumppi57 on Tue Apr 17, 2012 10:28 pm, edited 1 time in total. Played that some time last year. Absolutely terrible. Pole Position Manager 2010, does not have FIA license but with mods you can get the real drivers etc. I've played that. It's alright I suppose. Kind of ruins the management aspect when you realize that anything you do to your car or the drivers you employ ultimately doesn't matter because one perfect setup (which is the same for all tracks) will put you ahead of everyone by quite a margin, so there's no point in developing the car. In something like five seasons, I only lost a dozen races. All due to crashes or calculating the fueling incorrectly. Plus things like making your own engines takes far too long. It takes years to design a half decent one, by which point the regs have changed and you can't use it. There are also a lot of aspects to things like marketing, personnel management and finances which aren't really covered in much detail. The interface is fairly unwieldy too. Having said that, I did enjoy quite a few aspects of it and the mechanical side is fairly detailed. It just wasn't pulled as well as it could have been. GPW is still the best offline management game I've played. Maybe i should do a kickstarter project, 16 years experience should get me a bit of cash to set up on my own . It's still in the beta test but http://www.myracingcareer.com/r9080/ is turning out to be a good game. http://www.gprm.co.uk/ - starting at 2003 and still not released. All update only in the forum. I find My Racing Career the best at the moment. I've been playing it for a couple of months and it's really interesting. The ongoing season is the second one so the game is still quite new and there are all the time new series coming up and also other interesting things. It's completely free but if you want to give your gaming experience some depth you can buy a super licence which makes some things easier and you can design your own helmet and so on. Any thoughts of it? Just put in an application for Indycar - goodbye $800,000.. I was part of the iGPManager beta and carried on playing for a while after launch but it was a pretty fairy cakes game. They spent way too much time on really trivial stuff and it just wasn't fun and was way too easy. The Pole Position series is pretty crap too. GPRM will never be released - its been under development for over 10 years now with releases being promised every year. Never going to happen. It's based on the 1998 season but there's an online community that has designed additions that update the game for each season onwards. It's a lot but I've been saving my pennies since it started. Some good sponsorship and good results went a long way! But yeah, it's perfect for just killing time at work. Not too light in detail, but not so heavy that you can't come back to it after doing something and not know whats going on. Massive community and immersive gameplay, very popular in Italy but also in other states. Both 2d and 3d reproductions of the events. It seems simple from outside, but this game has tons of variables. Holy crap, I didn't think it was possible to turn the backmarker teams into title winners in 1 season. I won titles with Tyrrell and Minardi but it took me like 6 or 7 seasons. I think my crowning achievement could have been Damon Hill winning all 16 GPs in one season. I think I was managing Stewart. Yes it is not possible as far as I remember, not in one year, no way. Only with a top team could you win in one year. I also put my vote on F1-TM, i played the game for about two years and it is really brilliant once you get the hang of it. It will take you about 1-2 months ( if you play your cards right) to be competitive. Sure you will play alongside other newcomers from the beginning so it will be cool races there as well but in season three is where things get cracking. After that its all strategies, how to develop and research your car in the best way, how to train your drivers, how to put up financials and most of all... race strategy. If you really are into the Formula one world and strategies and all that. This is the game for you. Easy? NO! I seem to remember winning with Minardi in 2-3 years (virtually every race). My way was to sign Diniz and another pay driver and hire as many top engineers, designers etc as I could. If you put up with a year of failing to qualify or finish a race a lot, it all came good after that. You designed the best car and had the best marketing team to bring in the top sponsors too proving, in the game at least, the drivers were the least important part. Diniz as WDC is fantasy, but now it seems so many real team principals are relying on pay drivers (or those that bring sponsorship money with them), perhaps they learned their trade on GPW.